For me one of the most important factors for efficient local development is the ability to quickly toggle Xdebug on or off. 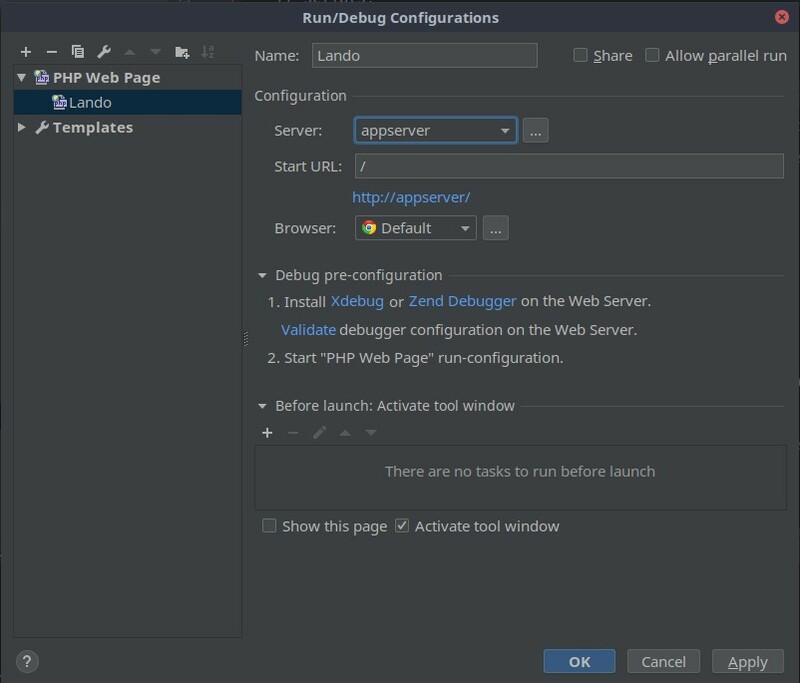 In this guide I will show you how to configure Xdebug for Lando and PhpStorm. Lando’s documentation instructs you to enable xdebug via the .lando.yml file. 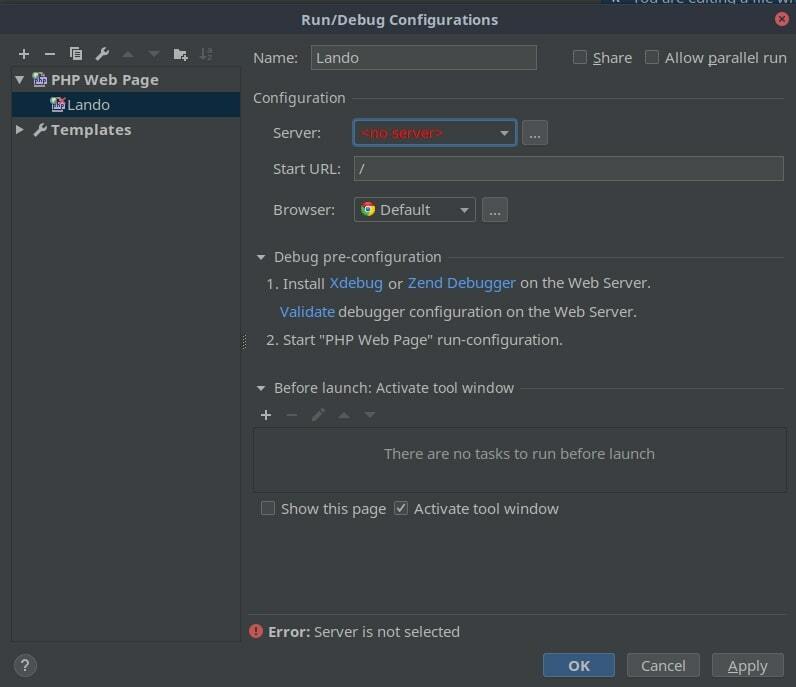 As of Lando RC2 you must set xdebug: true in order for the Xdebug extension to be loaded in your container. However, by default Xdebug will trigger on each request, which is not what we want because it makes local development painfully slow. The first line tells Xdebug to try to connect to the IDE (i.e., PhpStorm), which will only happen if two conditions are met (see below). The second line tells Xdebug not to start debugging automatically; we want to control when Xdebug starts rather than have it run on every request. The third line tells Xdebug to try to connect to whichever client (i.e., your browser) that made the HTTP request. This setting is particularly important for reliable debugging with Nginx servers. The last line is not essential, but it’s nice to see error messages formatted in HTML instead of plain text. For anyone interested, here is my Lando WordPress configuration. Configuring PhpStorm debug settings is actually fairly straightforward. 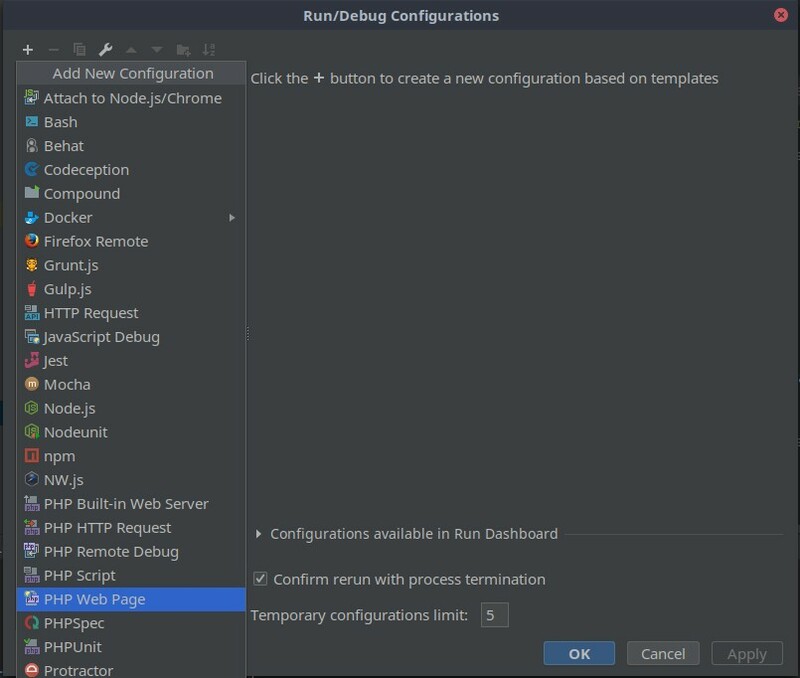 Click on Edit Configurations to open the Run/Debug Configurations dialog box. Choose the PHP Web Page option. Give the configuration a name, such as Lando. Next click the … to add a server. Configure a new server named appserver with a host of yourdevsite.tld. Check the box for path mapping and map the project root to Lando’s app root, usually /app. If everything is configured correctly you are ready to debug. As I mentioned earlier there are two conditions that must be met in order to begin debugging. 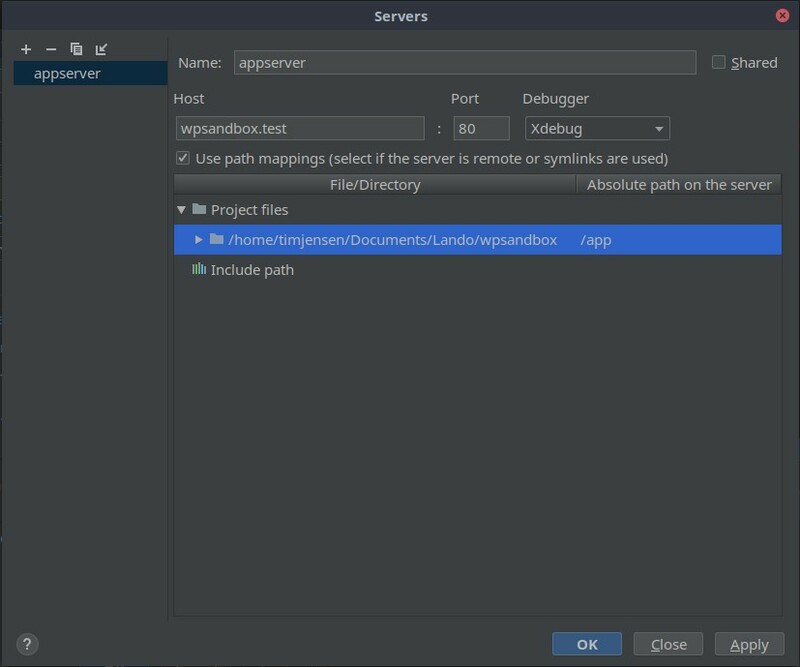 1) Set PhpStorm to start listening for Xdebug connections. The icon will turn green when enabled. 2) Set your browser to enable debugging. This is most easily done via a browser extension. When you refresh your browser with these two settings enabled Xdebug will be activated. Make sure you have a breakpoint set in order to pause execution. The easiest way to toggle Xdebug is via the browser extension. Once you are finished, disable debugging from the browser extension and set PhpStorm to stop listening for Xdebug connections. You may also debug command line scripts such as phpunit. Triggering Xdebug for command line scripts is slightly different because we cannot use the browser extension. Instead we must set environmental variables. Set the XDEBUG_CONFIG environmental variable: export XDEBUG_CONFIG="idekey=PHPSTORM"
Set the PHP_IDE_CONFIG environmental variable: export PHP_IDE_CONFIG="serverName=appserver"
Unfortunately you will need to repeat steps 3 and 4 each time you open a new terminal, but at least it’s not too much to copy/paste. As always, logging is a big help when debugging any piece of software, and Xdebug is no exception. You can enable logging by adding xdebug.remote_log = "./xdebug.log" to the php.ini, which is particularly helpful when debugging fails for no apparent reason. Mac users should find Selwyn Polit’s post helpful for fixing issues related to port availability. The article Setting up Xdebug with Lando and PhpStorm as well as the comments were helpful in figuring out the settings that I’ve described here. Also, many thanks to the Lando developers for building what I consider to be the best local development environment and for providing excellent support for the software. I’m sorry I can’t succeed to debug a WP-cli Command in a Lando/Phpstorm env. I foollowed your settings and launch a lando wp my-cmd but still no debug. 1. Add xdebug.idekey = "PHPSTORM" to your php.ini. 2. Once you restart your app, ssh into the appserver and run export PHP_IDE_CONFIG="serverName=appserver". 3. Set a breakpoint in your WP-CLI package and run the appropriate cli command.